Once you go solar, you can never go back and anyone who’s ever used solar lights totally gets this. Using solar lighting for your house and garden isn’t just great for your electricity bill, but it’s also fun and creative, giving you the chance to put your favorite areas under a big, bright light. Why use solar path lights? You may use solar path lights to bring more brightness to your outdoor areas so that you enjoy your nice, relaxing time with your friends and family for a couple of hours. Apart from lowering your electricity bill, solar path lights may improve the appearance of your house’s curb appeal, giving a more pleasant vibe to the outdoors space. You do need plenty of direct sunlight so that the solar path lights charge throughout the day. If that’s not possible 8 hours a day, you may get some help from a photovoltaic panel on the roof that should get sunlight that is more direct and transmit it to the solar lights on the ground. Most solar path systems give a soft white or amber-colored light, but you may also go for other colors (red, green, and blue) on the lights. It all depends on the atmosphere you want to obtain, in the end. Go for the solar path lights that come with LEDs as they hold the charge longer and are typically brighter than other types of bulbs. 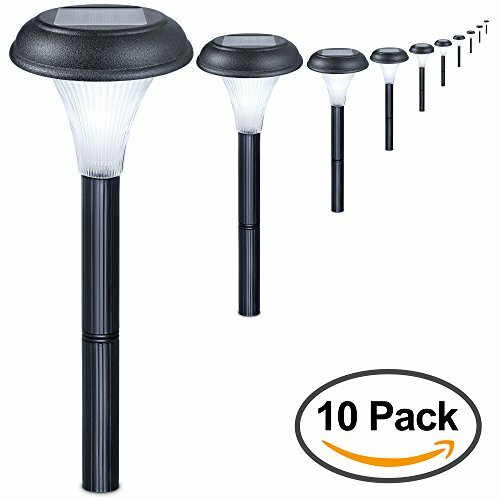 If you want bright solar path lights, try to get some that give more than a 40-watt light bulb. Simply check the description of the solar path lights and remember: the higher the number of lumens, the brighter the light bulb is. We’re not shallow, but take a look at the design of the lights. You may find a great variety of styles so it’s not impossible to find one that brings out the best of your path! After all, you want also pretty looks, not only bright light! 1). 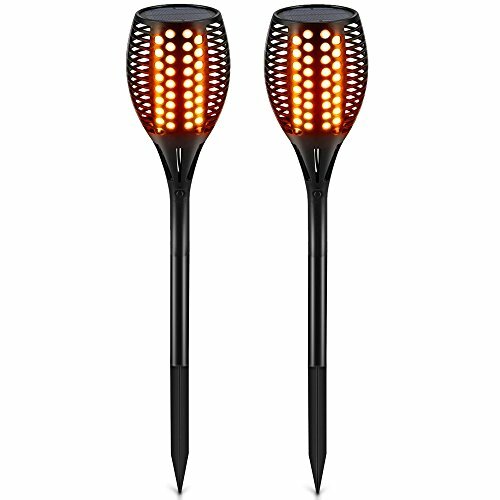 If you like to bring a bright, colorful and pretty vibe to your path, it wouldn’t hurt to give it a go with the BRIGHT ZEAL Solar Powered Garden Stake Light with Vivid Figurines in Life Sizes. The solar light is quite eye-catching and is a color-changing type, creating a nice, playful and colorful atmosphere in any garden. The bright LED of various colors (blue, green, orange, and rose) looks pretty and it slowly shifts from one color to another. The solar powered light charges throughout the entire day and may run for even 8 hours at night on a full charge. The light automatically turns on at night and changes colors slowly, warming up your path. However, it’s not only the pretty looks or the brightness that we like at the lights. We also like the good build as the petals are made from PVC that is water and stain resistant and BPA free. The pole stake is made of stainless steel, so it’s corrosion resistant, long lasting, yet lightweight. It offers good stability to the light, even on a windy day. The light is sure easy to assemble and to install. You don’t need any wiring for it or any tools. Simple, yet so effective, the light holds its charge and works all night. It’s well made and looks so pretty. Nevertheless, whenever in need to create a bright, colorful and playful vibe on your path, do try the lights. 2). 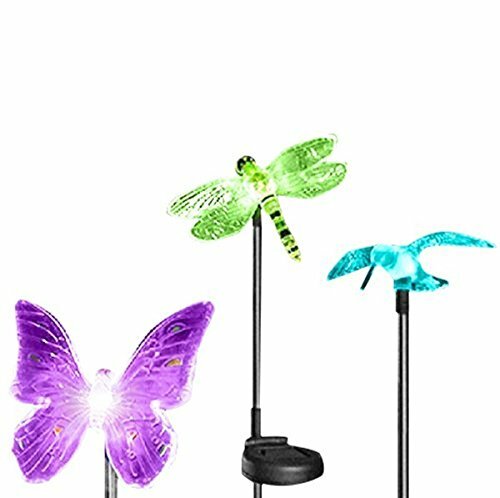 Bright and colorful, the OxyLED Solar Garden Lights, Hummingbird, Butterfly & Dragonfly Solar Garden Stake Lights are a great way to create a pretty atmosphere in your garden. The lights come in cute shapes of butterfly, dragonfly and hummingbirds and are molded with good quality material. They are lightweight, yet take the intense use. The lights are also waterproof, taking a splash and other weather challenges as well. They are controlled by manual on/off switch, whereas the built-in solar panel charges automatically all day long. The lights turn on automatically at night and run for 8 hours straight if fully charged. The lights feature color-changing LEDs and there are 7 colors to enjoy for lighting up your path. The lights are easy to install and you may use them for so many areas. 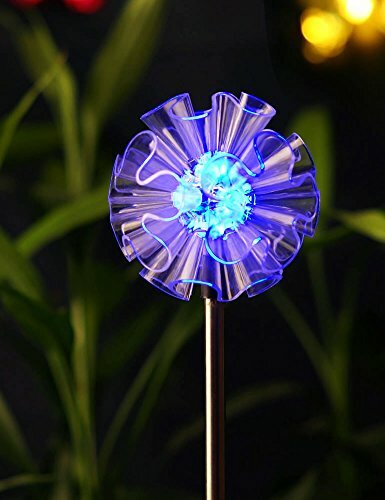 The stainless steel and ABS plastic stake gives stability to the light, whereas the crystal clear acrylic figurines look so similar to reality. The lights are pretty tall and look nice wherever you’d place them. They work well and they are bright all night. All in all, the lights are pretty, bright and fun to use so we’re not focusing on the inherent flaws that come along. 3). When you like better the simple design and want to light up your pathway as subtle as you can, a good option to consider is the Moonrays 91381 Payton Solar LED Plastic Path Light. 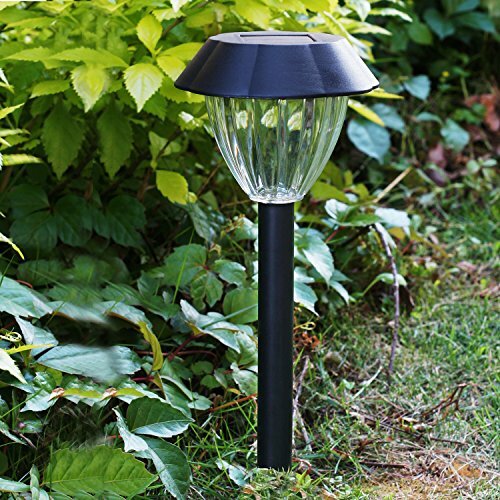 The light has an elegant feel to it and its sleek black finish fits in any garden. It features strong LED bulbs so it brightens up efficiently your path all night long. Charging over the day, the light shines during the night. It comes with a pre-charge AA NiCd battery that holds its charge. The warm-white LED is efficient and the light beam gives a 120-degree wide angle, covering a big area. The light turns on automatically at night and turns off in the morning. The build of the lights is good as they are made of black plastic, featuring hammered-glass plastic lens. The hammered look creates an elegant style, giving a nice shape to the light. The lights are also waterproof and take well the elements. They are easy to maintain and to install. You don’t need any wiring for assembling or installation. They don’t rust either. Bright and elegant, the lights change for the good the appearance of any path at night. Nevertheless, for the money you pay, you get reliable, elegantly looking lights that create a simple, yet bright, light on your path. 4). 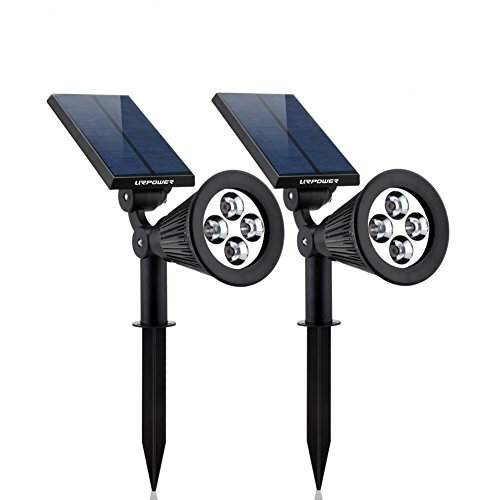 Some of the most popular solar outdoor lights out there that you may definitely use on your path as well are the Solar Lights,URPOWER 2-in-1 Waterproof 4 LED Solar Spotlight. There are many things to like on the lights and the compact shape is one to begin with. The lights are versatile as you may stick them into the ground (this is why they work for your path also) or wall-mount them. Either way, you don’t need any special skills or tools for installing them and they do came with the screws you need for the wall mounting. The versatility doesn’t stop here though and you may use the lights for both indoor and outdoor use. Another thing we like on the lights is their easy adjustment, which means you may set the solar panel so it gets the best sunlight exposure. You may also set the light angle so you do give the best illumination to the designated area. The lights come with LI-Io batteries that charge efficiently during the day. Furthermore, they hold their charge pretty well so the lights run the whole night. The automatic feature of the lights means they turn on automatically in the evening and turn off once the sun has raised. You may use two lighting modes (high or low) and the powerful LED bulbs give a maximum output of 200 lumens. Each light runs independently. The lights are well made and present a good build that takes the difficult weather conditions. With an IP64 waterproof grade, the lights are waterproof and safe to use on rainy days. Their compact design fits well in any scenery, but also expands their life span. Despite the minor issues, the lights are bright and look nice, in any scenery. 5). Handy and elegant, the Voona 8-Pack Solar Pathway Light Outdoor LED Garden Lights manage to bring a nice light on any pathway, in a simple and efficient way. The lights are made of plastic that is quite long lasting. They are lightweight, yet take up a good beating. They are very easy to assemble and to install. The classic light on stake design is effective, whereas the clear plastic lens ensures a nice light effect on your path. As a matter of fact, the light pattern is one of the things we like the most on the lights. The solar panel is efficient and charges during the day, lowering your electricity costs, while protecting the environment. Each light comes with a white, good LED that may run for even 8 hours after a full-day charge. The lights automatically turn on at dusk and turn off once the morning has come. The build of the lights is good and they are able to take the elements, as they’re also weatherproof. The black housing gives them an elegant vibe and the yellow glow of the light is so comforting. Durable, nice and elegant, the lights are an option not to be missed, especially considering the price. Despite the minor problems, the lights are still a good choice and quite a bang for your buck. 6). 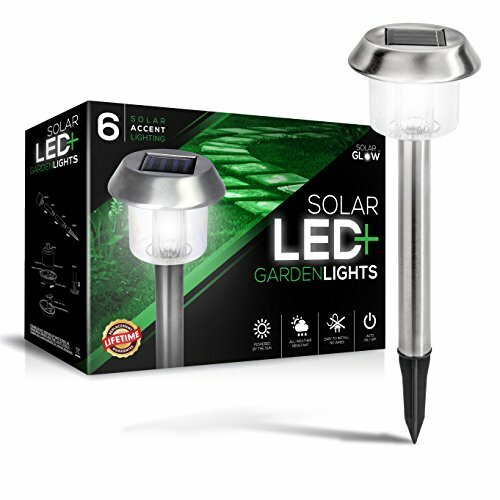 Able to charge even on a rainy day, the GardenBliss 10 Pack of Outdoor Solar Garden Lights for Your Yard Path Lawn and Landscape Lighting give a nice, warm, bright light that satisfies most of the customers out there. The lights are easy to assemble and to install and you don’t need any wiring for any. You simply push the stake into the ground and enjoy the light. They turn on automatically in the evening and turn off the same in the morning. The lights charge all day long and may even run for 8 hours if are fully charged. They include high quality LED bulbs that have a 20,000 hours life. The build of the lights is good and they are able to take rain, snow and sun. They are weatherproof and take the use for a long time. Another thing we notice on the lights is their height adjustability as each lamp comes with two posts, for various height. This way you may find the perfect height of the lights in your garden. The lights need AA batteries that charge efficiently and hold their charge. The dark plastic on the poles helps the lights to better blend in any garden. The styled plastic lenses are safe, especially around children. The warm glow, the nice looks and the waterproof build make the lights a reliable option when in need. For the nice looks, warm light and good build, the lights still stand as a good choice for any path or garden. 7). Automatic and reliable, the SolarGlow Stainless Steel LED Solar Garden Lights are versatile and so easy to install, sliding so easily to illuminate your paths! The lights run completely run on solar power and present automatic operation: they turn on automatically at dark and turn off at dawn. They recharge during the day and stay bright in the night. We really like the stainless steel design, which gives durability to the lights, and a nice, modern design to the lights as well. The light is bright and each of them ensures a 15 lumens output. The construction is rugged and the lights are weather-resistant. They handle rain, snow, sleet or frost. The ABS plastic build is tough and the lights have a durability feel. They are sealed tight, for better protection against the elements. The batteries are rechargeable and take the use for a long time. They hold the charge and are efficient. The lights are well made and so easy to use. 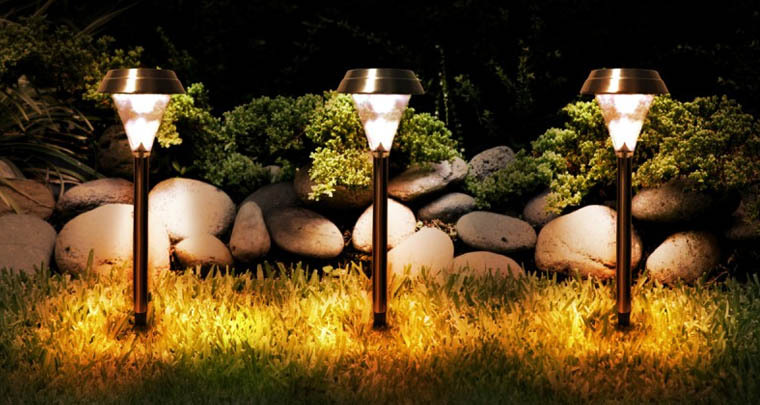 Well made, the lights are great for illuminating so many outdoor areas, not only your paths. Nevertheless, the lights are bright, dependable and weatherproof. In addition, they also look nice, which may seal the deal for many. 8). You don’t have to light up on fire your paths so that you can have some nice, flaming lights to create a “sparkly” vibe in your garden. Give it a go with the TomCare Solar Lights, Waterproof Flickering Flames Torches Lights Outdoor that create an impressive, flaming atmosphere every single night. The lights come with dancing; flame design and the LEDs cast a safe, soft, comforting glow on your path. The lights collect solar energy throughout the whole day, turning automatically on at dusk and off in the morning. They come with a built-in rechargeable Li-Io battery that may run for even 10 hours, if fully charged. It may surprise you in the wintertime with 5 hours run, needing 8 hours of charging on regular basics. We really like the shape and size of flames, which is highly realistic. The dancing effect is sophisticated and quite random so there’s nothing mechanical or repetitive about the motion. We also notice the good build of the lights that are weatherproof. They handle well the elements and are waterproof. Easy to assemble, the lights are also easy to install and to use. They give a pretty, bright amber color light and change for the good any outdoor space. For the nice dancing effect and bright light they give, the lights sure are worth to try when you go for a sophisticated vibe in your garden. 9). When you’re ready to step up your game, put your trust and faith into some solar lights as the Westinghouse Brown Kenbury Solar Outdoor Garden Pathway LED Stake Lights. Not only have you paid more for their brightness, but also for the high quality materials and durable build. The lights are using natural power of the sun and the build-in solar panel charges all day, giving you light at night. You don’t need any batteries or complicated outdoor power system for operating the lights. They turn on at night automatically and it goes the same way in the morning, when they turn off. The body of the lights is made with stainless steel that takes the elements rather well. The chocolate brown finish gives an elegant, pleasant vibe to the lights. As for the glass lens, it comes with a plastic ribbed cage that protects it from the elements, extending its life span. The LED bulbs come with AA 400mAh rechargeable batteries so they give bright light, for a very long time, taking the long use. The color changing LED bulb gives a bit of color to your path. We also notice the plastic ground stakes that are easy and fast to install. You don’t need wiring for it and the lights have a reliable stability. The lights burn bright and don’t surprise with their long lasting performance. They are very well made and have a stylish appearance. The good build, the bright light and the durability feel of the lights make them such a great buy, when in need. 10). The more you’re willing to pay for your solar lights, the more you may expect when it comes to performance and durability. 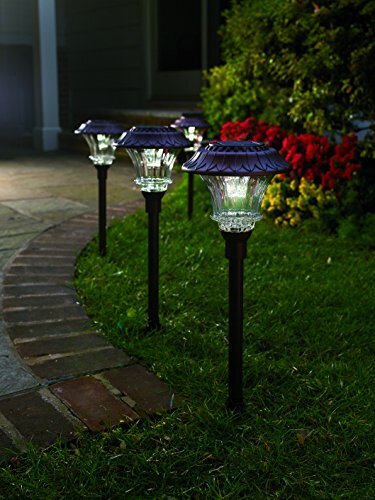 You may have to pay the extra buck for the Set of 4 Solar Garden Path Lights, Glass and Powder Coated Cast Aluminum Metal, but, no matter how we put it, we still think they are worth every single penny. 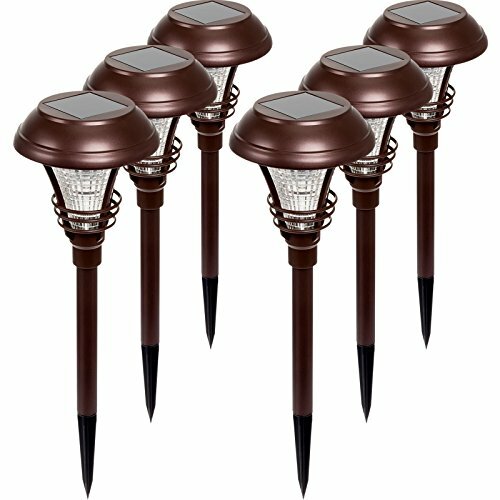 Each solar powered path light comes with 6 strong and bright LEDs that give a nice, white light. The illumination is impressive and the output is no less: 50-lumens output. The solar lights stand out also with their build, which is heavy-duty, ready to take the intense use and the weather challenges. The lights present a construction made with powder-coated aluminum and stainless steel, which always say longer life span and resistance to elements. They handle the hammering into hard soil and have a good stability. The tier ripple glass lens is durable and sustains high illumination. The build-in solar panel is very large and ensures 8 hours of light, if fully charged. It’s easy to put together the lights and to install them. They come with auto-on feature at dusk and an optional on/off switch. The lights also stand out with their classy appearance and the bronze finish brings an elegant vibe to any path. The battery has a long life and matches the heavy-duty build of the lights. The sturdy build, the impressive light and the classic look make the lights a good investment for your garden anytime. Made in our USA, the lights are a wise buy, no matter how picky you’d want to be.